CSUSB professors from various departments shared information about their research and its impact on campus and the community. Dr. Mihaela Popescu is an Associate Professor in the Department of Communication Studies and has an M.A. in Society and Politics, an M.A. in Communication and a Ph.D. in Communication Studies from the University of Pennsylvania. Dr. Popescu has ten different pieces of work published in the fields of First Amendment, cultural policies, and digital media policies. “I am currently working on a book that is about privacy in the age of data analytics and it is about looking at privacy differently,” said Dr. Popescu. “You know we tend to think of privacy as data privacy, sharing our private data and I believe that is an incomplete approach. So I am trying to look at privacy as a decision issue and identity issue,” she continued. Of all the research Dr. Popescu has done, the work that has made the most impact in her opinion is a piece published about cultural capital in Serbia. “It is about how people develop a taste in culture and the impact the social networks has on that, that is an article that has been quoted quite often and for the past year it has been consistently listed in the top 10 cited articles,” said Dr. Popescu. Esteemed lecturer Joel Harris in the English Department, has been with the English department for the past 12 years. Professor Harris is a CSUSB graduate and previously taught in Japan years ago. While there, he and a colleague of his created a textbook called Write About It, Talk About It, that was based on interactive small group discussions and receiving feedback from peers. “It was interesting to see the local perception. Professors at other universities in Japan were using it as an English as a second language (ESL) text for writing classes,” said Harris. The English Department is also home to Associate Professor Chad Luck. Professor Luck’s research interests include 18th and 19th-century American Literature and Culture, as well as Literature and Philosophy. “I had a book that came out in 2014 called The Body Of Property and it is a book that explores the way in which 18th and 19th century American writers think about and talk about issues of property and ownership,” said Luck. Professor Luck is currently working on a couple of articles and plans to write another book on philosophy in American Literature. “The impact that The Body of Property had for me, is the way in which it causes people to rethink and reevaluate the ways that they thought about culture and literature previously and I hope that the book will open up new questions,” said Luck. Dr. Stephen Tibbetts is a full professor in the Department of Criminal Justice and has published nine books and over 50 other pieces that mainly deal with the risk factors and explanations of criminality. Dr. Tibbetts also co-authored one of the texts used here on campus for criminal justice studies, titled, Introduction to Criminology. 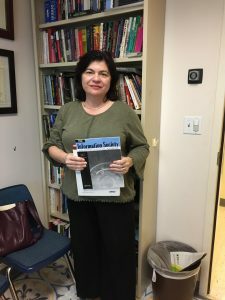 “This is the second edition, which is easier to develop because you are not starting from scratch and our book is one of the very few that actually has a criminological theory chapter that has a whole chapter just on feminist theory, written by Dr. Schram who is the Associate Dean of the College of Social and Behavioral Sciences,” said Dr. Tibbetts. Dr. Tibbetts also received the Golden Apple award in Spring of 2011, in which he was selected as the Outstanding Professor at CSUSB. CSUSB has more than 1,000 highly regarded professors, and this is just a small glimpse of our fellow educators.